Finding a good restaurant in Venice isn't always easy, especially in the heavily touristed areas near the Piazza San Marco. The authors of Chow! Venice have made it their mission to help you avoid "bad restaurants with high prices, unscrupulous waiters, and tasteless food." 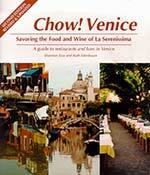 Whether you're looking for a simple pizza Margherita or a full-scale meal--or even a supermarket where, like us, you can buy shrink-wrapped Parmegiano Reggiano to take home--Shannon Essa and Ruth Edenbaum will point you in the right direction with the expanded and updated second edition of Venice's premier English-language restaurant guide. The nearly 90 pages of restaurant reviews are organized by neighborhood, making it easy to find suitable places to eat near your hotel or wherever you've been sightseeing. Detailed reviews indicate price ranges (keyed to a legend in the front of the book), whether credit cards are accepted, the nearest vaporetto stop, opening days and hours, and whether reservations are accepted or advised. The authors describe scores of places where you can get a drink or coffee, fill up on tramezzini, panini, or other food, and rub elbows with the locals or fellow tourists. Hungry for a cone? Looking for a bakery, a wine merchant, or a supermarket where you can load up on staples for your holiday apartment? Ten pages of listings (again, by neighborhood) will save aimless wandering. This six-page section lists a handful of shops that sell hardware and quality souvenirs. In addition to the Italian food and wine terms that may be in your phrasebook, this chapter includes many Venetian terms such as ombra (a small glass of wine served in a bar) and zabaio (zabaglione). Following the glossary are an index and a series of neighborhood maps with markings for the locations of restaurants and bars featured in the book. If reviews and food advice aren't enough to please you, not to worry: Chow Venice! is also a great read. It's seasoned with personal anecdotes, including a great story about good karma (and its rewards) in Harry's Bar. Verdict: Chow Venice! is well worth buying if you're spending a few days or a week in Venice and have more than a passing interest in food and drink. For more information, visit www.wineappreciation.com and read the excerpt on page 2 of this article.